Grand Canyon stamps have some pretty interesting stories behind them. 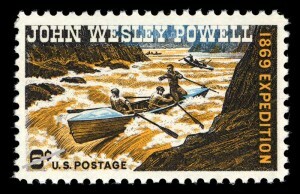 FDR’s Postmaster General ignited a Depression-era scandal with national park stamps. A 1948 stamp depicting a figure from Grand Canyon’s local history had Teddy Roosevelt fans crying foul. And in 2000, after a hundred-million screwed up stamps had been trashed, the final product still came out wrong.